The Lilywhites will have the same senior football manager next year. 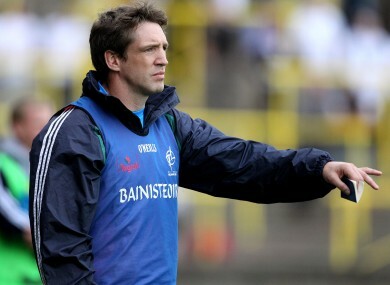 KIERAN MCGEENEY WILL remain in charge of the Kildare senior footballers for the 2013 season after he was ratified at a county board meeting last night. The Kildare GAA website has confirmed that the 2002 Armagh All-Ireland winning captain will stay on. McGeeney first took over the Lilywhites for the 2008 campaign and will now prepare for his sixth year at the helm of their football squad. McGeeney had been expected to stay on despite a disappointing 2012 championship that featured defeats in Leinster to Meath and in the All-Ireland series to Cork. Kildare did claim success earlier in the year by winning the Division 2 league title against Tyrone in April. McGeeney has shaken up his back room team with Castledermot man and former county defender Damien Hendy, who was involved between 2002 and 2010 with Kildare, replacing John Rafferty who has stepped down as assistant manager. Armagh native Rafferty was involved for this season’s campaign after fellow Orchard county natives Paul Grimley and Aidan O’Rourke had previously each done two-year stints in the role. Niall Carew will continue in his role as selector with another selector to be appointed shortly. McGeeney will also be in charge the county’s U21 team for next year, taking over the role from Alan Barry. Carew will also be a selector with that side along with Leinster Council delegate Syl Merrins and former Offaly and Laois manager Tom Cribben. Email “McGeeney set for sixth season in Kildare”. Feedback on “McGeeney set for sixth season in Kildare”.